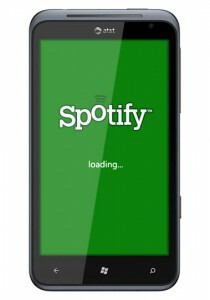 Today at the Windows Phone press event in New York, Microsoft officially launched an application that a lot of users have been waiting for: Spotify for Windows Phone. The application is looking very smooth, and like Windows Phone Mango in general, very snappy to use. It is also well integrated into the Metro UI making it look like a native application that just naturally belongs. The Spotify team has been working on this release since at least April, but after seeing the finished work it seems it was well worth the wait. In the application you can navigate by swiping back and forth in typical Windows Phone fashion between new releases, playlists, friend feeds, and more.